Equally weighted seems to be even better. Does anyone else having trouble seeing the correlation stats? I first noticed it yesterday. This way of this investor makes sense but it does not mean that waitng a good entry on single darwins is wrong. We know thanks to @easyFX analysis that darwins tend to mean revert, but I'm also wondering if could be possible that it works only as long as the market environment is the same. So may be if the market changes (like last months), it may be bad idea to try to wait for a good entry, because it would have been very good to invest in some darwins already doing ATH. 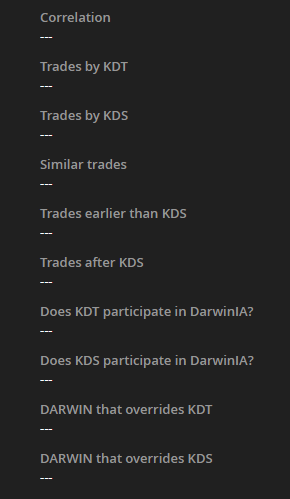 So I'm starting to think that the rule of "wait for a DD" or "wait until return 3M < 5%" to enter a darwin may be good only for the same environment. If a whole bunch of darwins are not showing good results, and then some other darwins are doing fine, that would (probably) mean that they are uncorrelated. So it could be better to buy darwins currently in ATH because that mean that they have an edge for this type of market. Just for information the big investor made a small nice gain, so it was not a "stop loss" and I dont' think neither a trailing stop. I am thinking of getting some more USD for diversification and this looks interesting to me (having mainly euros but hedged to usd and getting 2,5%+ per year). Would you mind giving some more details on how you go about that? Currently I hedge my cryptos in synthetic USD in bitmex (short with 1 leverage in futures) so I think I get the general idea. This will only make sense IF your expenditure is in USD, but you have to keep your capital in EUR - otherwise you will incur RISK for this 2.5% something return -> so it won't be a freebie. Assume I have X amount of USD as my capital. I convert X to EUR, and get Y EUR. Then on a broker with good swap rates, I sell Y EUR. Then Invest Y EUR however I wish - and on a monthly basis, readjust my SELL Y EUR position for new Y (my current capital amount in EUR). That makes sense? Please keep in mind that, if the "Spend USD, gotta keep money in EUR" is NOT true, the risk is probably not worth it. Since last week or so, it seems that volatility has seriously picked up across markets..
Edit: Bought 1000 OCD. Increased HFD to 1500 and MNW to 1500 (both were 1000). Anyone can recommend volatility breakout (?) darwin that is EUR independent? Dumped SKJ -> Divergence is unbearable. Don´t want to promote my darwin, as it´s not my way of being in this great community, but my darwin fits in what you are looking for. The EUR weight in total portfolio is now less than 15% and strategy stands on volatility/breakout of 3 different timeframes. I am already invested in OCD, plan to increase to 1.5k from 1k once open return reaches 10% I need something else that is also EUR independent. I got OOA,SYO as volatility ones. But they are retracement/contrarians , not momentum/breakout. I dont know how you define "volatility" darwins. According to the investors course the HFD,CLA,PUZ,DCD are not volatility ones so I am guessing you guys have a different thing in mind. What exactly you mean @yhlasx? Also, how would you categorize darwins @CavaliereVerde? LA : >6 momentum ; <6 contrarian . To be honest I cannot understand what the big guy is doing and that worries me a bit. For example the WSS,GFA darwins he chose for - maybe - short term look martingale- ish to me. What do you think guys?